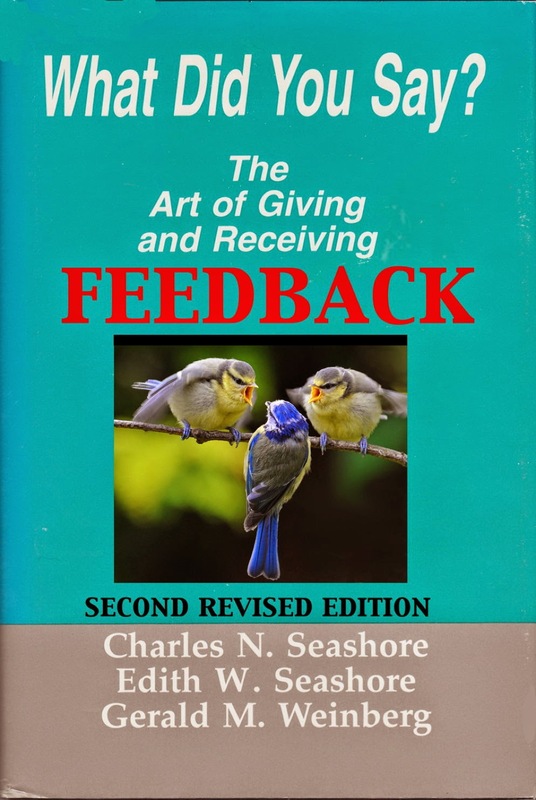 Continuing my weekly posting of excerpts from all my books, this week I offer the opening of the book on feedback I wrote with Charle and Edie Seashore: What Did You Say? Life is one man gettin' hugged for sneakin' a kiss 'n another gettin' slapped. Most people buy books on subjects they know about, but want to know more about–not on subjects they know nothing about. If that's true of you, then you may already know quite a bit about feedback–that's why you've picked up this book. It's a good thing when a reader begins a book with a head start on the subject–yet it can also create problems. In this instance, there are so many different meanings and connotations to the word "feedback"–depending on the discipline or specialized field in which it is being used–that each reader may know something different about feedback. which may influence future behavior. Example #1. Alice, an accounting supervisor in a construction company, had an outstanding record for high quality work carried out in a timely manner. She often wondered why other people got promoted to jobs for which she was better qualified. Brenda, who worked for her, also noticed that Alice always came in second. One day, at lunch, she remarked, "You know, Alice, I think a big reason you don't get promoted is that you lack visibility, professionally and in the community." Alice gave a speech on the new tax code at the local chapter of Administrative Management Society, and became chair of the public library board's financial committee. In five months, she was promoted. Example #2. Arthur, an assistant manager in a branch bank, also had an outstanding record for high quality work carried out in a timely manner. He, too, often wondered why other people got promoted to jobs for which he was better qualified. Brent, his manager, also noticed that Arthur always came in second. One day, on the golf course, he remarked, "You know, Arthur, I think a big reason you don't get promoted is that you lack visibility, professionally and in the community." Arthur was a panel member in a debate on auditing at the local chapter of Auditors' Club, and became fund raising chairman of the zoological society. His opinions on the panel offended a great many people, and his stand on refrigeration for the polar bear cages irritated even more. In five months, he lost his job. Example #3. Amy, a sales team leader in a recreational equipment company, also had an outstanding record for high quality work carried out in a timely manner. She, too, often wondered why other people got promoted to jobs for which she was better qualified. Her colleague, Bert, also noticed that Amy always came in second. One day, in the elevator, he remarked, "You know, Amy, I think a big reason you don't get promoted is that you lack visibility, professionally and in the community." Amy said, "Thank you for telling me that," but as she wasn't interested in promotions, she didn't do anything about it. In five months, she was still in the same job, doing high quality work carried out in a timely manner–and quite happy about it. Two years later, she got promoted to sales manager, and was very happy about that, too. Alice, Arthur, and Amy each received feedback about their approach to their work, including things they did and didn't do. Indeed, they each received the same feedback: "A big reason you don't get promoted is that you lack visibility, professionally and in the community." But since the influence of feedback depends on who receives it, they each experienced a different outcome. Example #1. Alice used the information about her visibility to try some new approaches, and succeeded in reaching her objective, a promotion. Example #2. Arthur used the information about his visibility to try some new approaches, and succeeded in offending a lot of important people. His reward was getting fired. Example #3. Amy heard the information, appreciated it for the way it was intended, but regarded it as irrelevant to her career. She did essentially nothing, but life went on, anyway. The concept of "feedback" comes from cybernetics, the theory of control. We can see from these three examples, however, that feedback may influence future behavior, it doesn't necessarily control anything. Feedback in cybernetics emphasizes the concept of a closed loop in a system providing a control function. The thermostat controlling the temperature in a room; the automatic pilot controlling the motions of an airplane; both are classic examples of cybernetic feedback systems. Figure_1.1. The simple feedback diagram. A (Alice, Arthur, or Amy) does something. B (Brenda, Brent, or Bert) notices what A does, or doesn't do. B responds to what A does. or doesn't do. A notices that B responds. A makes a decision what, if anything, to do about B's response. Although the diagram may seem simple, notice that, in the language of cybernetics, it forms a "closed loop." Once A responds to B responding to A's response, then the whole cycle reverses and repeats. A loop represents a relationship between two systems, in this case, two people. It could go on indefinitely, or it can come to a stop. Once it gets going, the closed loop resembles the chicken-egg problem. It may start with the most trivial action by A, but the final interaction can explode all out of proportion to the beginning. In such a situation, it's not always reasonable to say that A's opening action is the cause of the interaction. This breakdown of simple cause and effect is one of the reasons that feedback is sometimes so confusing. On the other hand, without the concept of closed feedback loop, we may never be able to understand human interactions at all. If we want to build, maintain, or test our relationships, feedback is our only source of information. Without feedback, how could we test the reality of our perceptions, reactions, observations, or intentions? If we want to share our feelings, what other way do we have but feedback? If we want to influence someone to start, stop, or modify their behavior, how else but feedback? In short, feedback is critical every time you interact with anybody, about anything. Carl Rogers, the psychologist, observed that one of our most powerful needs is to be heard and understood. Without feedback, what would keep us from inventing our own reality? Without feedback, how could we distinguish between what's going on inside us and what's happening in the rest of the world? At work, we see many examples of feedback, because feedback is fundamental to helping anyone who wishes to improve their performance, reach an objective, or avoid unpleasant reactions to their efforts. Feedback enables people to join with other people to achieve more than any one could achieve alone. Feedback also lets us avoid people who will obstruct our efforts. Feedback is also important for keeping performance the same when the environment changes. For instance, now that she has a new job, Alice will need feedback to adjust her outside activities to her new situation. Under some conditions, feedback may become critical to our very survival. Without response for stimulation, people withdraw, hallucinate, and eventually die. In the work situation, the worst punishment you can inflict on a person is to isolate them from all co-workers, with nothing whatsoever to do. Why is feedback so universally important? Our environment is constantly changing, so we can't survive unless we adapt, grow, and achieve with others. But, unless we can do magic, we need information about how we performed in the past in order to improve our performance in the future. Which brings us to the subject of you. If you want to change your behavior in some way, or to preserve your behavior in a changing environment, it's not likely to happen by magic. You will need some kind of feedback. Why? Feedback is a systems concept. 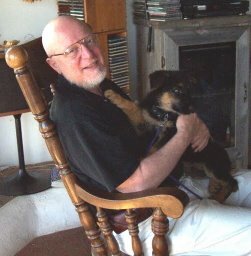 We are used to thinking of airplanes or computers or businesses or governments as systems. You may not think of yourself that way, but you're a system, too. Of course, you're a much more complex system than, say, an airplane. Although airplanes need very expensive feedback control systems, you need the finest feedback that money can buy. In fact, if you want to make significant changes in your life, you'll probably need something better than money can buy. You'll probably need information from other people about what impact you have on them, and that can only be obtained by a process of give and take. We call that kind of information interpersonal feedback. This book is about how to give interpersonal feedback, how to take it, and how to make the most of what you give and take. It's about sifting the important from the irrelevant, distinguishing the information from the distortions, and seeing the patterns in a series of specific instances. It's about adding new information without becoming confused or incoherent. And, finally, it's about how to maximize the conditions in which you can share your thoughts and feelings with others. Although interpersonal feedback is essential in all aspects of your life, we're going to focus on your work life, where you already have an invaluable collection of experiences. If something you learn at work happens to influence other aspects of your life, consider it a bonus. Let's look at one series of examples of feedback that one person might receive at work. Sally is an accountant, and all these things happened to her on one Friday. Are any of them familiar in your own typical day at work? During a morning meeting with clients, Sally corrects an error in one of Jack's figures. The client is angry with Jack. After the meeting, Jack screams at Sally and tells her that she did the same thing two years ago. Then the boss calls her in to his office where he congratulates her on her sharp vision. At lunch in the cafeteria, Sally coughs without covering her mouth. Willard turns the other way, Sylvia raises her eyebrow, and Jack makes no visible response. After lunch, Sally interviews a potential new client. The client compliments her on her suit, but later she hears that he has decided to engage a competing firm. Sally is sorry to lose an account, but also pleased because she is sick and tired of getting feedback from clients on her clothes instead of her work. She was not looking forward to giving yet another client that feedback. At coffee break, Sylvia tells Sally that Willard is upset because Sally is too friendly with the boss. Her daughter's teacher calls to say that her daughter is very upset about the small amount of time she spends with her mother. The teacher wants to know when they can schedule a conference to figure out how Sally can take time from her work to help her daughter make a smoother transition into first grade. In the elevator at the end of the day, Sally tells a joke. Jack laughs, Sylvia snorts, and Willard pinches Sally's shoulder. These few examples illustrate the wide range of interaction that comes under the title of "interpersonal feedback at work," yet these are only a few of the thousands of instances of feedback that Sally receives in a single day. All this information may be "better than money can buy," but if you are like Sally, you'll see how easily she could be confused when she tries to use this feedback to improve or maintain her performance at work. Not all the feedback is about her and her impact. Some of it is about what someone else thinks she is doing, or wants her to be doing, or even who Sally reminds them of. Not only that, but the timing of the feedback is often unfortunate. The feedback often arrives days, months, or years late. It comes in different ways from many people at the same time, or from the same person at different times. And, when it comes, it often finds Sally off balance and vulnerable. Is this familiar, too? It's not surprising that Sally doesn't always receive the feedback as intended, or act on it even if she does. In most cases, after an hour or so, she won't even remember what she heard. Or maybe you also find yourself on the sending end of feedback. Perhaps your job requires it, or perhaps you just like to give more than you like to receive. We'll also be writing about why some people's feedback is heard fairly much as they intend, while others can't seem to get their message across no matter how hard they try. If you're interested in how to use feedback more effectively within an organization, then the place to start is right here–learning how to use feedback more effectively with the individuals who make up that organization. For snother view of the consequences of feedback, take a look at my novel, The Aremac Project. When one of the protagonists experiences an accident that renders her unable to communicate, she is unable to provide feedback about a murder she witnessed. Without normal feedback, how can she save her life and the lives of the ones she loves?